World 5-2 is the second level of World 5 in Super Mario 3D Land. The level is a temple played from an overhead view, as a homage to the temples from The Legend of Zelda in honor of the series' 25th anniversary. Mario starts in a rectangular room with a ? Block and a rectangular ? Block. Going through the exit on the right side of the room, a similar room is found, but with a sand area and two Spinies. The next room is wider, and contains spiked cylinders and one more Spiny. Going to the right, Mario finds a very small circular place, where a Spike Bar is spinning on the middle. Here, Mario can go in two ways: the area ahead to a Star Medal and to the left, the regular way. Going to the left area, he sees a Checkpoint Flag, Spinies and lava. A Mystery Box is also found here. An up-and-down moving platform conducts the player to a sandy corridor with a row of spiked cylinders. Entering inside a door, Mario is taken to a place with Crates, Spinies and lava geysers. The end contains a door that goes to the final area, where he can use a breaking stone to grapple the top of the Goal Pole. Star Medal 1: When the player reaches the room with the Spike Bar, the player must go to the south end of the room and jump up into it to reach the Star Medal. Star Medal 2: The player must have a Fire Flower and head to the east path of the rotating Spikebar where the previous Star Medal was found. 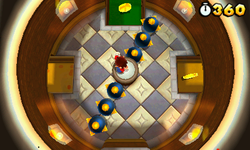 Lighting the four torches in this room causes a door blocking the room with the Star Medal to open, along with triggering the "puzzle solved" sound effect from The Legend of Zelda series. Star Medal 3: Near the end of the level, there is a long row of spiked cylinders. The Star Medal is located at the very end of the room. The developers of Super Mario 3D Land originally wanted this level to be World 2-5 instead, as another reference to the 25th anniversary of The Legend of Zelda, but felt that the reference would be too early if placed there. Still, 5-2 is 25 backwards. This page was last edited on April 5, 2019, at 18:14.